When Anna Kharzeeva began organizing master classes in the culinary arts of various countries, she found that the workshops were not only a way of getting Russians interested in international cooking, but also an excellent way of facilitating cultural exchange between Muscovites and the foreigners who teach the classes, who come from all over the world. Three years ago, when I was working as an English teacher, I often heard my students ask the question “Where can I go to practice the language?” People were lacking live communication with native speakers outside of formal lessons. So I started to organize and conduct culinary master classes in foreign languages in Moscow, where the teachers were expats and the participants were both expats and Russians studying languages. While many people who came were more interested in communicating and practicing the language than in cooking, there were also participants who were there primarily for the culinary aspects. They would take notes and often asked for words to be repeated. The conversation very frequently centered on traveling to the country whose cuisine we were studying. It was clear that the participants in these master classes traveled a lot and were generally well-versed in various foreign dishes. People were either planning on visiting the country whose cuisine we were studying or asked the teacher and other participants about which museums to go to and where to stay. Other visitors to the restaurant would sometimes try to order what we had cooked, while sometimes they would simply approach us, introduce themselves, look at what we were making, and take a copy of the recipe with them. Professional chefs and culinary lovers taught our classes. It was noticeable that the teacher was always more interesting than the food itself. All of the participants would ask how the person ended up in Russia, how long he or she had been living here, and whether or not he or she liked it. They would leave the master class with fond memories of the evening and of the person who introduced them to a new cuisine and culture. Mexicans Jorge Luna and Gris Garcia came to Moscow to meet Russian and Mexican visual artists. Both of them love food, so they decided to attend a culinary master class in Russian cuisine. The participants were so interested in hearing them talk about Mexico’s culinary traditions that Jorge and Gris ended up teaching the next master class. “More than 10,000 kilometers from home, we thought about what to put on the menu. The food needed to be not as spicy as we’re used to and made out of ingredients that are available in Moscow,” the two Mexicans explained. “We chose guacamole, quesadillas, Mexican rice, and rajas con queso. It turned out that it was very hard to find good, cheap avocados. When we were buying the ingredients, we discovered that Russia has almost the same type of sour cream as we have in Mexico,” the chefs said. “When we share our country’s food abroad, we feel that we’re sharing Mexican culture, and besides that, it gives us the opportunity to create a little island in time and space where we can feel at home, no matter how far away we are,” they added. Yang Chuan Hu has been living in Moscow for over 20 years and worked as a chief at a Chinese restaurant for 17 years. He speaks Russian well and teaches master classes. “When I came to Russia in 1991, we had to greatly adapt Chinese cuisine to Russian tastes. Russian and Chinese cuisine are completely different, and at first our food was too unusual for Russians,” said Hu. 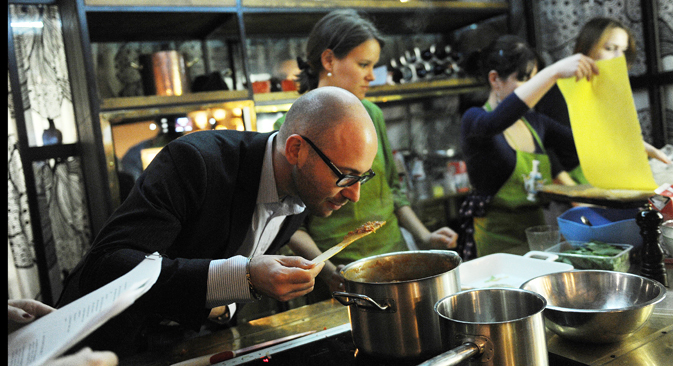 Aside from master classes in foreign cuisine, there are also master classes in Russian food for foreigners in Moscow. Participants range from expats who have lived in Moscow for several years to tourists visiting for just a few days. Anyone with an interest can learn how to cook familiar and beloved Russian dishes such as borscht, pirozhki (small pies), and beef stroganoff. Those who want to learn about Russian cuisine from the inside can not only order the food at a restaurant, but also participate in the cooking process. They can learn why Russians add dill to everything (many foreigners are baffled by the ubiquity of dill weed in Russian cuisine) and how to serve pirozhki or vareniki (dumplings). The participants are all united by the desire to better understand Russia and Russians and to learn about the culinary traditions and history of Russian food. Some participants have Russian roots and want to find out the recipe for their grandma’s pies. It turns out that in the United States they often call them vareniki. One time an elderly woman from Australia came to me – her husband had Russian roots, and she was interested in learning more about Russia. Despite her age and health, she came to Moscow for a few days, and the culinary master class was almost the main part of her program. She observed the process of making vareniki and schi (cabbage soup) with great interest and said that when she got back to Australia she would definitely cook a Russian dinner for her husband, children, and grandchildren. This is how many participants approach the master classes: A recipe is a souvenir of sorts and a memory of a trip that participants can share with all their friends and loved ones. Read more: Golubtsy and vinaigrette remind Australians of… McDonald’s?